Learn how to use popular Adobe software. Knowledge about Adobe Creative Cloud can unlock a ton of potential for you and your business. If you plan to launch an image-driven social media campaign, you'll want Photoshop under your belt. If you want to edit promotional videos now and then, you should know how to use Premiere. To be your own graphic designer and create stunning visuals, Illustrator and InDesign are must-haves. 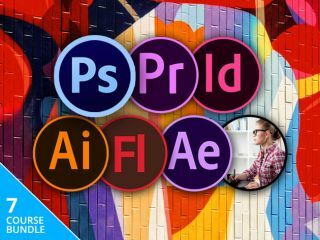 With The Complete Adobe CC Training Bundle, you'll learn about all this software and more, for the price of just $29 – that's 95 per cent off the regular price. Take your business to the next level by learning Adobe Creative Cloud. To find out more, take a look at our Creative Cloud CC review, or sign up now.